I like young people. I work with them every day. My worst moments in school never have anything to do with them -- it's always something or someone else, most usually the adults. The kids, though, are usually the reason I have any hope for the future. They make me laugh; they really want to learn, provided the lesson is sincere and insightful. So, why, when I look at the Internet, do I feel extreme distaste toward the behavior of young people? It's because the Internet is a window of negativity. We all know this. And, if we know this, why do we let it shape our picture of the outside world? 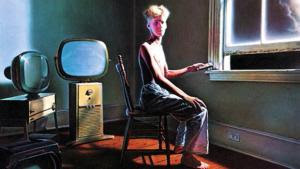 The Power Windows (Rush) album cover, by Hugh Syme. I don't let the Internet picture disrupt my view of young people because what I see of the real, live ones every day reminds me that "the kids are alright" -- to steal a phrase. But how many other things are tainted for me by the window of negativity? How many other things come to me through the invisible digital wire that are not corrected by daily, flesh and blood reminders? It is a frightening question. The only answer, I suppose, is optimism in the face of the worst apparent (and non-stop) evidence possible. And that ain't easy.